The House of Representatives on Saturday said it was shocked to hear that N2.1bn of newly printed N1,000 notes was missing at the Nigeria Security Printing and Minting Company. 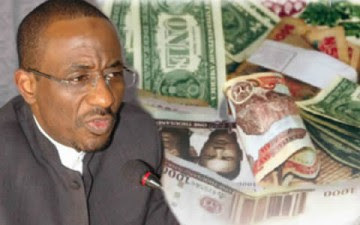 Last week, the Central Bank of Nigeria Governor, Lamido Sanusi, launched an investigation to ascertain the quantity of money missing at the NSPMC and reportedly asked the Managing Director of the agency, Ehi Okomoyon, and its Head of Security, Emmanuel Bala, to go on compulsory leave. The Chairman, House Committee on Banking and Currency, Mr. Chukwudi Onyereri, said that the committee had already waded into the matter and was in search of the truth. He said due to “conflicting information” before the committee on the theft, it had opted to invite Sanusi and the management of the NSPMC. When contacted on Saturday, the Director, Corporate Communications, Central Bank of Nigeria, Mr. Ugochukwu Okoroafor, in a telephone interview with our correspondent said he could not comment on the issue. The Media Adviser to the NSPMC, Mr. Obi Adiele, however said it was N900, 000 and not N2.5bn that was stolen at the company. He said, “The amount reported is false. It was not N2.1bn that was stolen. What happened was that there was a security breach and one of the security operatives was arrested with about N900,000 in Lagos two weeks ago. Meanwhile, opposition political parties have attributed the cash theft to the Federal Government’s laxity in fighting corruption. The National Publicity Secretary of the All Nigeria Peoples Party, Emma Uneukwu, said, “One basic fact is that corruption has become endemic in this country and the present leadership is paying lip service to it. Since people have discovered that the present government is not serious with fighting corruption, they have resorted to all forms of criminality and brazen acts of corruption. It’s happening everywhere, the pension board, the NNPC, name it. So, the NSPMC is not an exception. Similarly, the National Publicity Secretary of the Congress for Progressive Change, Rotimi Fashakin, said the incident had shown that corruption had reached new heights in the country. When contacted, the National Publicity Secretary of the Action Congress of Nigeria, Lai Mohammed, said the party was investigating the incident. “This might be just the tip of the iceberg,” he said.